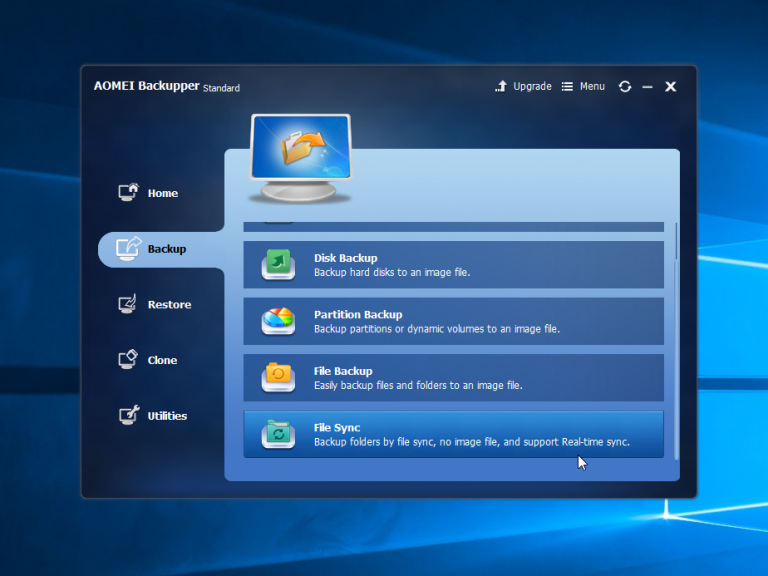 AOMEI has released AOMEI Backupper Standard 4.0, the second major update of its freeware Windows backup, imaging and cloning tool in 2016. Version 4.0 adds an additional arrow to the tool’s bow -- the ability to sync file changes in real-time. There’s also added support for a number of popular cloud storage devices as well as a number of more minor improvements. The new real-time file sync feature is available from the main menu, and basically allows users to back up in real time -- the program will monitor files for changes, then sync any new, modified or deleted files from the source to the target path as soon as they’re detected. Users also gain two new options when choosing a destination -- both revealed by clicking the drop-down arrow next to the destination path. The first is "select a cloud drive", which provides convenient shortcuts to the root directories of any supported (and installed) cloud services. These include Google Drive, OneDrive, Dropbox, SugarSync, Box, Cloudme and hubiC. The second option is "Select a network share or NAS", which takes users to the Share/NAS Management screen. Here they can add connections and then browse for specific shared folders to save to. The File Restore option has been tweaked to allow users to restore selected files instead of having to restore complete file paths. One notable fix resolves problems sending email notifications to a custom Gmail account. Elsewhere, users can now upgrade to the Pro version from within Backupper Standard without having to install any new software. The install wizard has been redesigned and simplified to better support one-key installation. Backupper’s Technician and Technician Plus editions also gain a new image deploy tool, while Technician Plus also allows users to deploy portable versions of the software. AOMEI Backupper Standard 4.0 is available now as a freeware download for PCs running Windows XP or later. Paid-for versions are also available with additional features such as command-line usage, disk space management and the ability to merge backup images.